Thank you to Hennie for posting the following question: I’ve been working with wool and silk rovings and doing some needle felting. Another idea to incorporate into our fibre work. If you haven’t already talked about using rovings I wonder if you would be interested in having some discussion around this topic? Incorporating unspun fibers and rovings has been my focus for a number of years. I appreciate Hennie broaching this topic as I encourage students and creative thinkers to explore using fibers ranging from sheep’s wool, silk, Tencel, rayon, bamboo, nylon, mohair, and angora. It is a way to step out of the proverbial box to add dimension, texture and intrigue to a piece. My preferred method to affix rovings to a wall hanging is needle felting. For those readers who may not be familiar with the method of needle felting: Special barbed needles are used to push loose fibers through the background fabric to add texture to the overall piece. Felting needles come in handheld single and multi-needle felting tools, and a little over seven years ago the embellishing machine came on the market capturing much attention. Over the years I have discovered a couple of ways to successfully integrate loose fibers into my own work. I love using grey and white fibres, both dull and lustrous, for sky scenes. 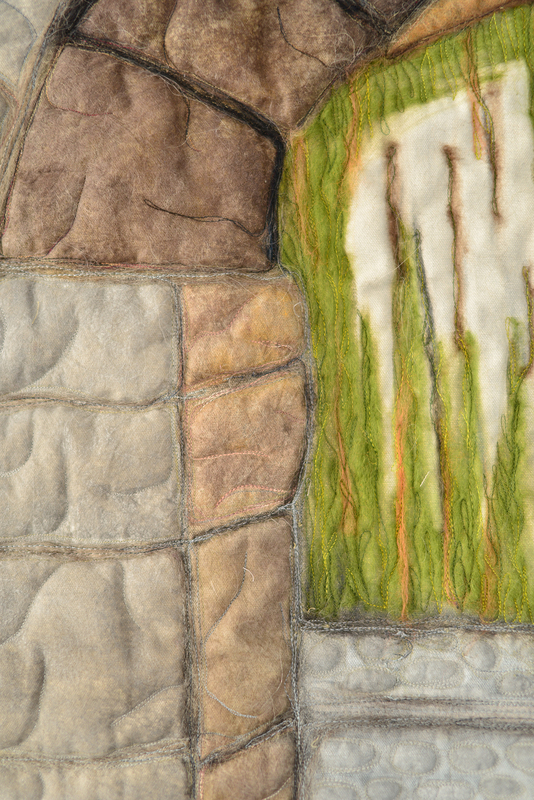 I layer these fibers across the representational landscape, employ the multi-needle felting tool to push the fibers into the sky area, and finally I overlay all with fine tulle. This is held in place by machine quilting, suggesting cloud and wind patterns. Examples can be found on my web gallery from 2009. Look for Low Tide in the Bay of Fundy near Alma Beach, NB, Breathtaking Beauty: La Roche Perce and Land of the Living Skies. Another favorite way I use rovings in my work is to proceed as before, by needle felting the fibers in to place, then add quilting stitches directly over the fibers. Spring Fling and Raven’s Territory (found in the 2009 web gallery) are good examples of stitching over the needle felted sections. I recently completed a large architectural piece where I incorporated grey rovings to resemble mortar between stones. Below is a detail of this piece. Wool fibers are used in the mortar sections, silk and wool fibers are part of the greenery. I do own an embellishing machine. It was an opportunity not to pass off at the time. I have used it a handful of times – and I love the effects I get on small works suitable for framing in a shadow box. For larger works I prefer to use the hand-held tools, both single and multi-needle. I use a variety of Clover felting tools. Single needles I hold between my thumb and first finger for optimum control. The “mortar” above was punched through with the Clover Pen tool containing three barbed needles. Larger areas are affixed with the 5 needle felting tool. (Note: I do not receive endorsements from Clover, however I do believe that their tools and needles are durable and versatile). Needle felting to enhance the landscape will be part of my workshop in Abruzzo later this year. Over to the readers: How do you incorporate rovings and loose fibers into your creations? Everyone is curious and wants to know! Leave your input and suggestions in the comment section below. Looking forward to reading about your experiences. 30 May	This entry was published on May 30, 2013 at 6:55 am. 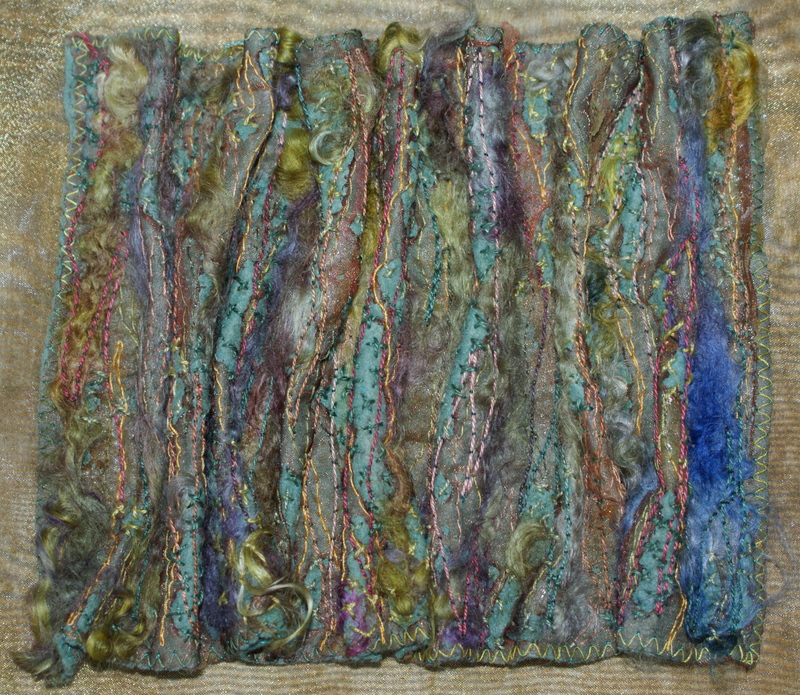 It’s filed under Art, Design, History, Journaling, Studio / Workshop / Creative Space Challenge and tagged Clover felting needles, Felt, Fiber, Fiber art, Roving, Silk, wool. Bookmark the permalink. Follow any comments here with the RSS feed for this post. Not sure what “rovings” are. I have been playing with ribbons, cords, beads and things to embellish. Lots of felting in these parts and I have tried my hand at it. Happy to hear that many incorporate it into quilting as that was the reason I tried it. So many new things to learn. Enjoy your postings as always. Katina, “rovings” are fibers that have been washed, carded and are put up in continuous “lengths”. Spinners who do not wash and card their own fibers use these. Felters often line these as they don’t have to wash and card the fibers to align in one direction. Hope this helps..
I’ve used silk roving incorporated into my own cording. I just loosly catch the roving. The roving then becomes wispy clouds for my corded landscape scenes. An example is in the current issue of the CQA magazine “Where do you read your CQA magazine” pg. 25. I hadn’t thought of felting it. I think I’ll have to try that. Thanks for the idea. Thank you, Vivian! I agree, the embellisher does embed the fibers deeply – I have found that the little machine has a tendency to shred by back ground fabric, especially when I use a lightweight canvas. Thanks for the link. I am sure this will be of interest to the readers. Thanks for sharing, Marilyn. Sounds like you are a huge fan of the embellishing machine. Can’t wait to talk with you more this summer.